Albert Einstein’s brain can now be downloaded to your trusty Apple iPad, should you own one. Sadly it’s not an iOS-compatible simulation of the top physicist’s mind, best known for coming up with the general theory of relativity and laying the ground work for quantum mechanics. Instead it’s a selection of photos of slices of the German-born boffin’s grey matter. 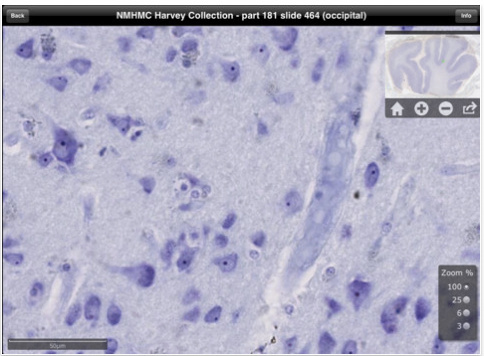 Still – the app will let iPad users get as close to the great man’s brain as any neurobiologist can. Einstein’s brain was removed and preserved when he died in April 1955. Pathologist Dr Thomas Harvey of Princeton Hospital split it into 170 parts and sectioned them into microscope slides. He then stained the wafers to highlight the cellular structure and nerve conduction tissue. Dr Harvey’s collection of brain samples was bequeathed in 2010 to the National Museum of Health and Medicine in Chicago, which has just scraped together the cash to digitise the slides and put them in a new iPad app. The software is available from Apple’s App Store for $9.99, or £6.99, and funds will go to the museum. The magnified high-resolution images give fanbois the view that they’d get if the brain slides were on the business end of a microscope, and the app makers hope opening up one of the world’s greatest brains to neurobiologists everywhere, as well as the the general public, will garner new insight into the workings of the Nobel prize-winning boffin’s cerebral matter. Nothing exceptional was found about Einstein’s brain in 1955, but a 1999 survey found that it contained a rare density of connections between neurons in the language, spatial and mathematical areas. One severe limitation of Harvey’s slides is that it is hard to tell exactly where each sample was taken from Einstein’s brain: the 170 parts are loosely attributed to the brainstem and various lobes rather than specifically located. Solving the location of the brain parts is now considered to be much more important. The Chicago museum features another interesting brain from Dr Harvey’s collection: Henry Molaison, who died in 2008 after living for decades with profound amnesia.